At Cirrus Laser we use both C02 gas lasers with a wavelength of 10.6 microns (far infrared) and solid state lasers. Gas lasers generate the laser beam inside a resonator; normally made from glass. Inside the resonator there is a partial vacuum of about 120 mBars and filled with Helium, Nitrogen and CO2gases. The different wavelengths of lasers determines the type of materials that can be cut and typically CO2 gas lasers are good at cutting hard materials such as steel and stainless steel. 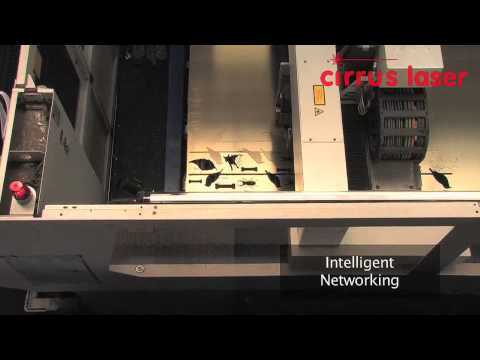 Cirrus Laser also use solid state lasers, a 3kW disk on Laser #8 with a wavelength of 1.03 microns (cutting and welding) and a 12W marking laser with a wavelength of 1.06 microns - Laser #10. Solid state lasers are also good at cutting steel and stainless steel but also reflective materials such as brass and copper. More details of our machinery can be found on the Laser Cutting Machines page. The focused laser beam is used to vapourise the material to be cut, however, an additional cutting gas, or assist gas, is needed to blow or remove the molten material through the thickness of the metal being cut. It is exactly similar in principle to oxy / acetylene or oxy / propane cutting, where a fuel gas and oxygen are used to heat the metal until molten and then an additional nozzle blows oxygen through the material thickness to remove the molten metal. But although the principles are similar between oxy / acetylene and laser cutting, the control and fine detail obtainable from the laser process is far superior to most other heat cutting processes. You can check out our 5 axis Cell 3000 during a store Tour. To arrange this please contact Mike Martyn - DD - 01273 252 563.